Die Video-Installation „terre-moto“ von Roger Kausch ist in der Ausstellung „grosse kunst“ im Staatsgut Achselschwang, Utting, von 4. – 12. Oktober 2014 zu sehen. Roger Kausch: Video-Zeit sichtbar und hörbar machen. Video-Zeit sichtbar und hörbar machen. 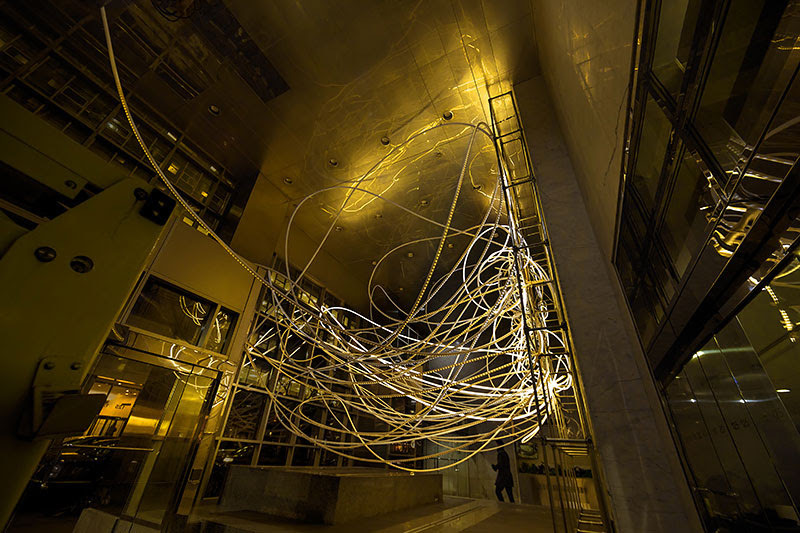 New York – Time Equities Inc. and Art-in-Buildings, is proud to present BREATHLESS MAIDEN LANE, a light sculpture installation from a recent series of works by Peruvian artist Grimanesa Amorós. The installation will be on view from March 26th through December 24th, 2014. 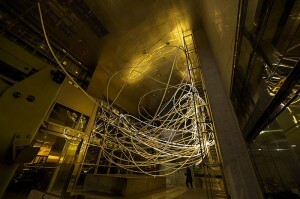 I created BREATHLESS MAIDEN LANE as a site-specific installation for Time Equities Inc. Art-in-Buildings in New York City. „Breathless“ conjures the idea of excitement. When a viewer approaches my work, I want them to experience an intense response. New Yorkers have especially developed habits of dealing with the multitude of stimuli that surrounds us every day. When a viewer approaches the light installation, I want to override the viewer’s tendency to ignore their environment and increase their awareness of their surroundings. I initially developed my concept for this project by walking around Maiden Lane. I immediately felt a strong connection and interest in learning more about the street. I researched and studied Maiden Lane’s history. To my surprise, there were many theories about the area. In one of my searches, I discovered that the street was called Maagde Paatje when New York was known as New Amsterdam. Another fact I uncovered was Maiden Lane’s history as a winding path for lovers. This winding path provides a perspective, much like the street patterns of Lower Manhattan. Early city planners patterned the majority of the streets in this area to follow pre-existing waterways, rather than the grid pattern imposed on the majority of Manhattan. For this reason, the streets of Lower Manhattan appear chaotic. The surroundings, the energy, and the people created this busy area. The lane prompted a feeling of BREATHLESSNESS. This installation includes different sizes of white tubing and various shades of white LEDs. I placed a gridded metal truss against the back wall of the marble atrium in response to the soaring windows that dominant the building’s architecture. BREATHLESS MAIDEN LANE gives the sensation of rays of light hurtling toward the viewer. With this work, I invite viewers to discover a new way to see and experience Maiden Lane. Like many of my large-scale works, I created BREATHLESS MAIDEN LANE for the community and the many individuals who walk by 125 Maiden Lane every day. With this work, I continue to explore my fascination with the intersections of light, sculpture, abstraction, and landscape. The sculpture’s light sequence will shift and change as the viewer walks around its architectural complexity. The concept of BREATHLESS MAIDEN LANE is to allow the viewers to feel a sense of wonderment and awe. Grimanesa Amorós (born in Lima, Peru) is an interdisciplinary artist with diverse interests including social history, scientific research and critical theory. She uses sculpture, video and lighting to create works that illuminate our notions about personal identity and community. Amorós’ work explores the duality between ancient spirituality and modern technology. BREATHLESS MAIDEN LANE is curated by Jennie Lamensdorf, director of Art-in-Buildings. Time Equities Inc. is committed to enriching the experience of our properties through the Art-in-Buildings Program, an innovative approach that brings contemporary art by emerging and mid-career artists to non-traditional exhibition spaces in the interest of promoting artists, expanding the audience for art, and creating a more interesting environment for our building occupants, residents, and their guests.